More than 2.5 million people worldwide suffer from Multiple Sclerosis (MS). The triggers for this chronic inflammatory disease are still obscure, but may be connected to light! It has become very clear that people from northern Europe, North-America, and Canada are more often afflicted by this disorder than people who grew up near the equator. If infants move to sunnier regions, the risk of developing MS adapts to the new surroundings. The question the scientists from Münster wanted to answer was whether environmental factors (i.e. sun exposure) influence the immune system. Their result: moderate sun exposure supports the development of a healthy immune system and helps to protect the central nervous system from unwanted attacks. This effect is known from other diseases. Prof. Karin Loser from the University Clinic for Dermatology says: “From the treatment of psoriasis we know that UV light has a beneficial effect on the immune system.” Whether that is true for other disorders as well is what the neurological scientists from the University Clinic tried to elucidate in collaboration with the Dermatological Science Department using an animal model as well as in patients. 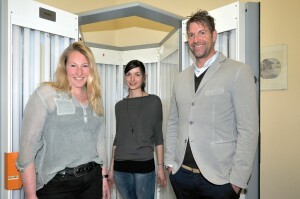 Over six weeks nine MS patients went into a specially made “sun chamber.” The radiation was performed on every workday. “The results are astounding,” says Loser, “we could find more regulatory T- and dendritic cells than before in the blood and the skin of patients, as soon as after the first appointment.” Both cell types prevent the immune system from attacking the patient, which is the main problem in MS. The team of scientists could prove in skin biopsies that UV-B radiation triggers a complex process in MS patients: In the skin exposed to UV-B radiation, tolerogenic dendritic cells are induced, which subsequently “educate” regulatory T cells in neighboring lymph nodes. In parallel, the exact molecular pathways could be elucidated in the animal model: the induced regulatory cells migrate from the skin to the site of inflammation, meaning the blood, the bones, or – in the case of MS – the central nervous system. The cells trigger a protective reaction in the immune system and dampen the damaging immune response. However, this protective effect faded even more quickly than the tan: If the treatment was interrupted for even a few days, the blood parameters and immune status worsened immediately, in mice as well as humans. The results show very clearly how the environmental factor “UV light” influences the development and course of MS. “Apparently, there is an axis between skin and nervous system. UV-B radiation influences the immune tolerance in the nervous system. This influence is short-lived, reversible, and surpasses the mere effects of Vitamin D by far,” Prof. Heinz Wiendl (Director of the Department of Neurology) summarizes. Right now this treatment is no replacement for traditional therapies, but the results of this study might help in expanding the repertoire of MS treatments in the future. This study was supported by the DFG and the KKNMS and the project is part of the SFB/CRC-TR 128 Multiple Sclerosis and the excellence cluster Cells in Motion (CiM).